The Red Equinox has dawned, and the old gods who have slept for aeons are stirring. Urban explorer and photographer Becca Philips was raised in the shadow of Miskatonic University, steeped in the mysteries of her late grandmother’s work in occult studies. But what she thought was myth becomes all too real when cultists unleash terror on the city of Boston. Now she’s caught between a shadowy government agency called SPECTRA and the followers of an apocalyptic faith bent on awakening an ancient evil. As urban warfare breaks out between eldritch monsters and an emerging police state, she must uncover the secrets of a family heirloom known as the Fire of Cairo to banish the rising tide of darkness before the balance tips irrevocably at the Red Equinox. Red Equinox was a book I got for review months ago. Seriously, a stupid amount of time ago, and I’m just now getting around to reviewing it, because I fail at life, or something. Better late than never, right? First of all, I got this as an audiobook. It’s narrated by Susan Saddler. I’ve never heard a book narrated by her before, but I instantly loved her voice, and the way she read the book. She has a sort of unique sound, but it just fit into the story perfectly. Half the battle with audiobooks is finding a narrator who really sounds right for the story they are reading. Not every narrator is a hit, and it did take me a little bit of time to really warm up to her, but it was worth it. By the time the book ended, I couldn’t picture it read by anyone else. Red Equinox got my attention from the start. It’s sort of a dark, brooding horror-type story with a nice dash of fantasy thrown in for good measure and a ton of history and background that all weave together to form the story that we have here. The other thing that was a surprise about this book was just how weird it was. Some people have compared it to Lovecraft’s work in some regards, and I do see that. This book is its own unique thing, but it also is a love letter to some books that have come before it. The protagonist, Becca Philips, is a photographer, which was fantastic as that’s something that I can intimately relate to, and her style of photography is really unique. Wynne had to do a lot of research (or maybe he knows from personal experience) about photography to accurately pull a lot of those descriptions and details off. Becca’s love for photography drives her into some unique areas, and her personal family history, the things she knows about her family (her grandfather, specifically) also carries her to certain locations for her photography. It’s on one of these outings that Becca runs into her family history head on, and from that moment on, the book completely takes off. The horror elements are pretty captivating, and I loved how Wynne flawlessly wove together history, current day Boston, and all of these otherworldly elements that are unique to this book. One thing that I really loved about the book was how much of it focused on relationships, and none of these relationships really moved in any of the directions I expected them to. The dialogue between characters was fantastic, and very realistic, but it was also down to earth and believable. Perhaps that is one of the best parts of the book, not only are the characters wonderful, but they are incredibly human and real, and they serve to balance out a lot of the fantasy, and Lovecraftian elements of the story. Wynne is a great author. He knows how to propel a plot forward, and flawlessly weave together so many different elements that create the story. The book felt incredibly streamlined, and though it was complex, Wynne has a way with boiling down complex elements to make them easily absorbable by his readers. Furthermore, he crafted a great eerie atmosphere which he used to his advantage throughout the book, building on it as things progressed until it culminated in an ending that perfectly suited the story being told. 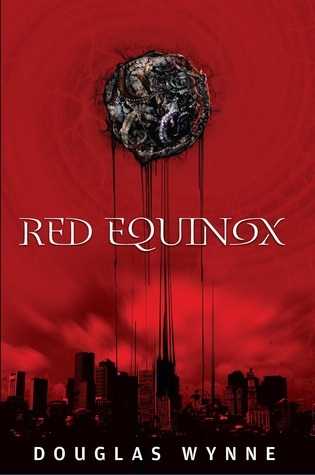 Red Equinox wasn’t what I expected, and it’s really the first book of this nature that I’ve ever read, but I enjoyed it. Wynne has a way with making a complex story feel less complex, and easily digested by his readers. The characters were realistic, the plot flowed nicely, and the narrator was the cherry on top of the sundae that was this book. Is this worth reading? Yes, if you’re in the mood for something off the beaten path, and completely its own animal, then this is the book you’re looking for. Just felt i should let you know that I’ve started listing to this in audio format because your review of this interested me and I went to looked it up at Amazon and gave the audio sample a listen. I knew I’d have to get the book when I had to listen to the audio sample all the way through. I don’t usually do that.